Given the threats from climate change, the Los Angeles region must manage its water supply sustainably, reduce consumption, and improve its infrastructure. The majority of water consumed in Los Angeles is imported. Scientists conservatively project a loss in Sierra snowpack of at least 25% by 2050. Climate change will decrease the reliability of Los Angeles’s water supply, particularly imported sources, while putting stresses on water infrastructure statewide. Water consumption varies across the region, residents of the City of LA consume 93 gallons per day, residents of east Los Angeles consume 48 gallons per day. LA County homes use more water outdoors than they do indoors. Water has arguably been the most central feature in the history of the Los Angeles region, and it remains a pivotal issue in reducing the region’s vulnerability to climate change. Adopt Model Water Efficient Landscape Ordinance (MWELO) provisions for a dual water metering (indoor-outdoor) for all new construction, and assess costs and benefits associated with retrofitting existing buildings. Adopt and implement conservation pricing approaches for water rates using tiered block rate structures (or implement budget-based water pricing), while avoiding impacts to low-income households and addressing informational, behavioral, and cognitive barriers to effectiveness. Adopt the Model Water Efficient Landscape Ordinance (MWELO) for new construction and require retrofits upon sale, lease, or remodel of existing buildings. Achieve a retrofit rate of at least 1% of existing building stock per year by incentivizing MWELO retrofits and by implementing requirements for retrofit, upon sale for properties meeting MWELO threshold landscape areas. Research and support water-neutral development through “zero net water” technologies in new developments. Expand programs and funding to support the creation and health of appropriate landscapes, including: assisting the nursery trade to shift to low water-using plants, with an emphasis on natives; educating gardeners about low-water landscape maintenance; and increasing the number of composting facilities and compost distribution. Require leak detection and repair through the development of sustainable funding mechanisms. Allocate funding to assist small retailers (not covered by Urban Water Management Plan requirements) to install leak detection systems, conduct water audits, and implement other related BMPs. Develop high resolution spatial estimates of recharge potential for stormwater capture to prioritize installation of regional and distributed BMPs. Use the IRWMP process or other regional forums to systematize region-wide sharing of information on conceptual projects (in addition to shovel-ready projects), to facilitate potential cost sharing and efficiencies. Enforce the Low Impact Development (LID) provisions of the MS4 permit for new construction to achieve a 100% compliance rate. Require LID retrofit upon sale for properties exceeding some threshold acreage. Develop approaches to encourage aquifer storage and recovery, including possible modification of groundwater basin adjudications via state law, in order to allow conjunctive use. For basins not currently adjudicated, address the issue of storage and recovery as part of collaborative efforts to comply with the Sustainable Groundwater Management Act and form groundwater joint powers authorities to manage the basins. Assess requirements for new developments to hook up to recycled water distribution pipes if they are within reasonable distance (e.g. 200 yards) for potable uses. Assess and quantify the tradeoffs between distributed and centralized wastewater treatment using an integrated water management approach. Create acceptable, effective solutions to increase demand for recycled water. Provide input to the feasibility assessment of direct potable reuse, currently ongoing by the State Board, Division of Drinking Water. Increase reinjection of treated waste water in groundwater basins where adjacency exists. Support the demonstration and scale-up of new technologies for seawater and brackish groundwater desalination that reduce associated cost, energy demand, greenhouse gas emissions, and impacts to marine wildlife and coastal ecosystems. Support the demonstration of improved technologies for the treatment and reuse of greywater for potable uses. Implement any local actions available to preserve lifeline rates, including the option of state legislation to allow and require municipal water providers to offer these rates. Support state constitutional reforms for sustainable water management. Provide assistance to replace high-water-using appliances. Provide assistance to transition to low-water-using landscaping. Provide incentives for owners of multi-unit dwellings to conserve water through shared savings with tenants and deployment of water conversation technologies and practices. 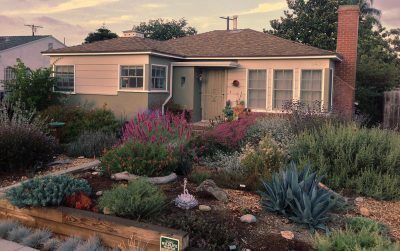 Transition urban greenspaces to California native and California-friendly landscapes, in part in order to maintain public health benefits. Consider advancing stormwater projects that create new parks and open space. Consolidate failing drinking water systems with larger public systems. Groundwater contamination plumes are complex in their movement. Careful monitoring needs to occur to make sure that no activities accelerate the dispersion of contaminated groundwater. For any new development in the region, measures must be developed such that the development does not require additional new water. This may occur through a menu of options that each locality develops from investment into a fund that assists existing building owners to retrofit their appliances, to new irrigation technologies for public open spaces or water recycling facilities. A Greater LA: Climate Action Framework is a project of the Los Angeles Regional Collaborative for Climate Action and Sustainability. The CA Strategic Growth Council provided funding for the project.